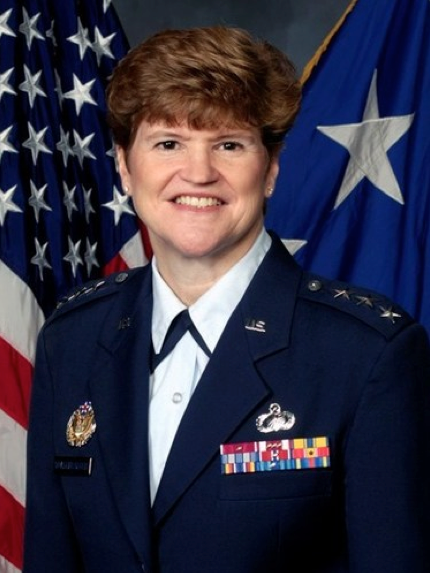 Last week the President nominated Lt. Gen. Janet C. Wolfenbarger for appointment to the grade of General, with assignment as Commander, Air Force Materiel Command, Wright-Patterson Air Force Base, Ohio. If her nomination is approved by the Senate, Lt. Gen. Wolfenbarger will be the first female four-star General in the U.S. Air Force. She follows in the footsteps of US Army Gen. Ann Dunwoody, who, on November 14, 2008, became the first woman in U.S. military history to achieve the rank of four-star General. Air Force Materiel Command, where Lt. Gen. Wolfenbarger is currently Vice Commander, is the largest command in the Air Force with a yearly budget of $60 billion. At Wright-Patterson Air Force Base they conduct research, development, test and evaluation, and provide acquisition management and logistics support necessary to keep Air Force weapon systems ready for war. Lt. Gen. Wolfenbarger has held a variety of assignments at headquarters Electronic Security Command and Air Force Systems Command. She is a 1980 graduate of the Air Force Academy where she received a Bachelor of Science degree in engineering sciences. She began her career in acquisition as an engineer at Eglin Air Force Base, Florida. In 1985 she earned a Master of Science degree in aeronautics and astronautics from Massachusetts Institute of Technology, and in 1994, she received a Master of Science degree in national resource strategy from National Defense University. Lt. Gen. Wolfenbarger has received a number of major awards and decorations, including the Distinguished Service Medal, Legion of Merit with oak leaf cluster, National Defense Service Medal with bronze star, and the Global War on Terrorism Service Medal. This announcement took place in the same week that the Pentagon unveiled plans for expanded roles for women in combat, allowing them to fill thousands of frontline jobs - approximately 14,000 posts - including as medics, helicopter pilots, intelligence and communication analysts.